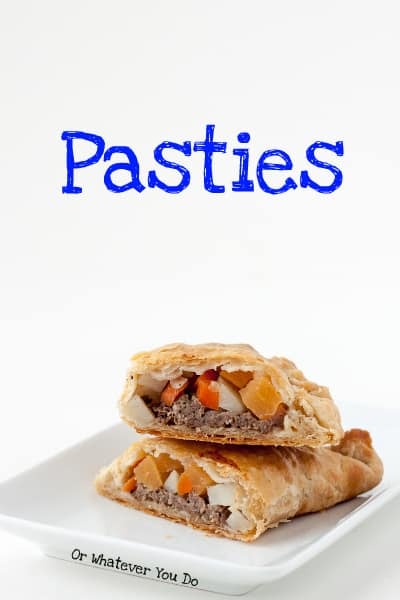 Pasties were always a staple for us growing up. 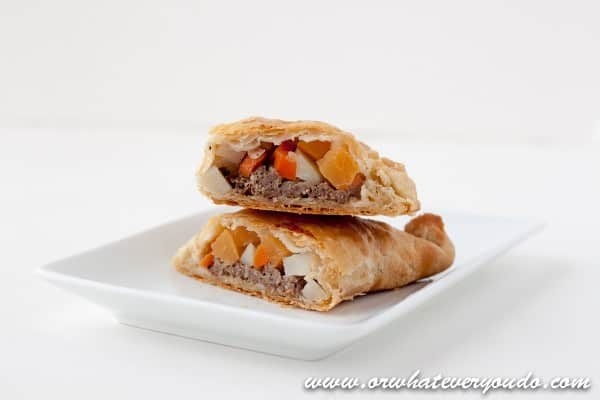 These meat and vegetable-filled pastry pockets are warm, hearty, and delicious. 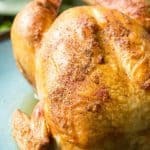 Wrap them in foil and bring them for lunch, or make a bunch for dinner. I would guess a large number of you have never heard of these. I didn’t even know how to pronounce them until I was well into my teenage years (PAST-EE), and we have stores in my home town devoted to making ONLY these little pockets of awesomeness. Growing up, local churches had sales to raise money using these. They were well loved and traditionally made for the iron-ore miners by their wives so they would have a utensil-free meal to eat during their long days of mining. Even growing up on the edge of the Iron Range in Northern Minnesota, I didn’t have any miners in my immediate family. 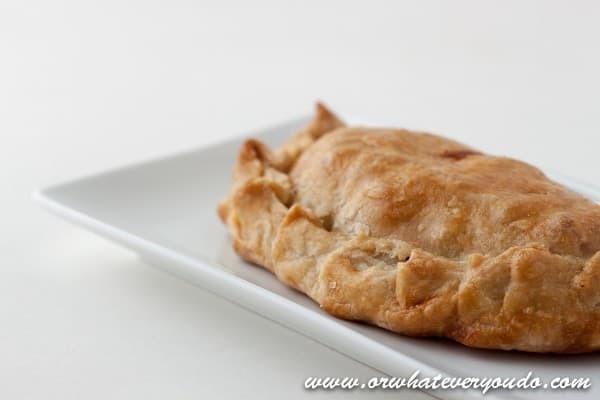 That doesn’t mean I can’t appreciate a good pasty filled with traditional meat, potatoes, and rutabaga filling. The essential starting point for these is a really good, really simple pie crust. If pie crusts freak you out, don’t let them. You can ONLY get better with practice, and once you get a feel for it you will never go back to the store-bought variety. Chunk up your cold butter and shortening. I always buy the shortening sticks because they are easier to measure and chunk up for pie crusts. My favorite crust recipe is always a mix of salted butter and butter flavored shortening. If you don’t like the “butter flavored” portion of that, feel free to use regular shortening or even all butter if you prefer. 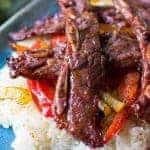 If you want to go FULL ON MINNESOTAN these would be wonderful served with some chicken and mushroom wild rice soup or this wild rice hot dish soup! 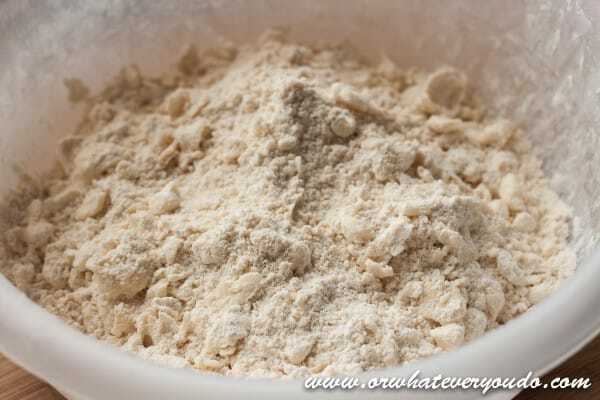 Add the flour and using your hands, squish the flour into the butter chunks, breaking the chunks up and flattening them out a bit, until they are small pea-sized chunks coated in flour. Add in most of your ice cold water and mix together with a wooden spoon until it comes together into a ball. It should be slightly crumbly, but able to stick together. For the dough into a disc and wrap it in plastic wrap. Place that in the fridge for at least 30 minutes. 1-2 hours is better, but if you are in a time crunch, 30 minutes will do. 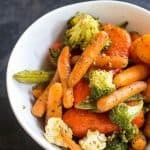 While the dough is chilling, cut up your veggies. Before tackling this recipe, I had never actually cooked with rutabaga. It was a little intimidating at first, but after diving in, it is really just like any other root vegetable. A little tougher than potato, but similar. I cut a chunk off, peeled it with my vegetable peeler, and chopped it up into a small, 1/4 inch dice. 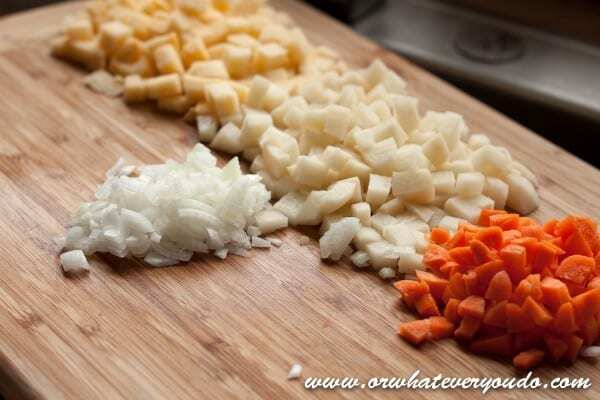 Then I did the same with the potatoes, carrots, and onions. Chop up some fresh flat leaf parsley while you are at it too. I really need an indoor herb garden. I have been spending a small fortune on fresh herbs lately. LOVE them. Now remove the chilled dough from the fridge and cut it into 6 equal parts. 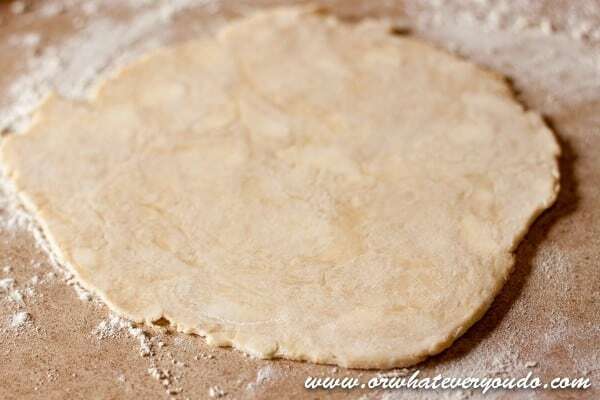 Roll out each portion of dough into a circle somewhere between 1/8-1/4 inch thick. 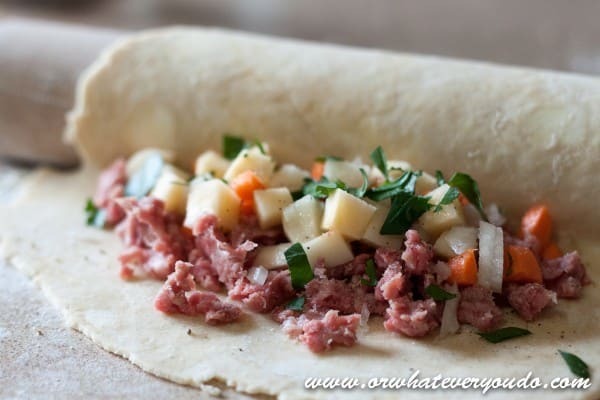 Chunk up equal amounts of ground pork and ground beef and place it on half of the dough. And yes, you are seeing this right. It goes into the dough raw. I was surprised when I learned that is how it is done too, but it really turns out great this way, so trust the method! 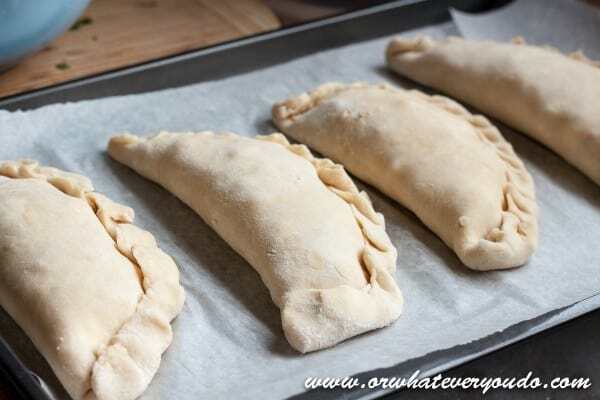 They key to a really good pastie is seasoning each layer of ingredients really well, so give that meat a good dose of salt and pepper before topping it with the veggies. Then go ahead and salt and pepper those veggies too. 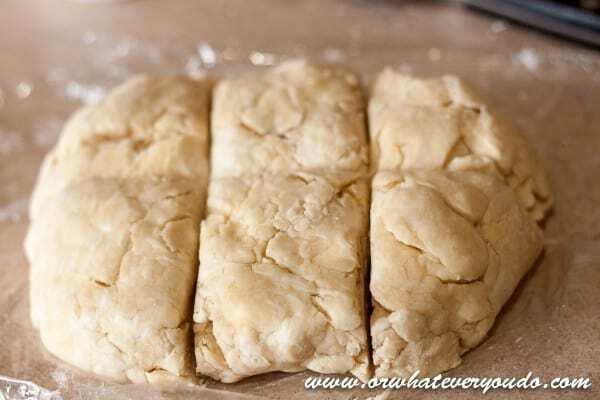 Fold the top half of the dough over the filling, lightly wet the edge with wet fingertips, and press to seal. Next, you crimp the edge by folding it up and over slightly. This part is kind of hard to describe for me. I think next time I make these I will do a short video demo because its easier to do than say! Repeat with the rest of the dough and filling. 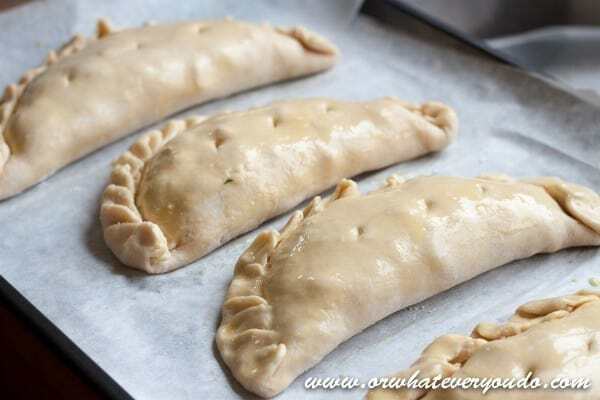 Brush the pasties with an egg wash, and poke a couple of small holes in the top for steam to vent out of. Bake at 350 for about an hour, or until they are golden brown. 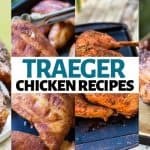 I served these with a quick pan gravy because that’s how we do it in Minnesota. I’ve been told that in Michigan these are served with ketchup, which I also tried with the leftovers and was pretty happy with. 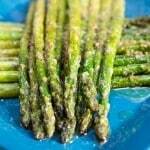 These were a hit with even the pickiest of my kids, which kind of shocked me because OMGosh!!! Vegetables!!!! Even ONION!!! AHHHHHHH!!!! Guess the flaky pie crust won them over. 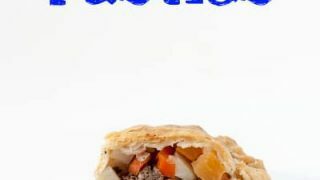 Tender flaky crust encases a rustic mix of meat and vegetables in these traditional Minnesota pasties. Preheat oven to 350 degrees. Prep your pan by lining with parchment paper. 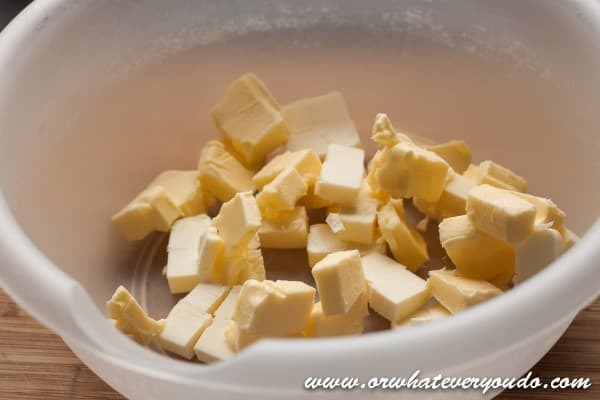 Cut up butter and shortening into dice-sized chunks. Add flour and mix together by hand until the butter is in pea-sized chunks. Add 3/4 cup of water and stir together with a wooden spoon. Add more water as needed to form a slightly crumbly ball of dough. 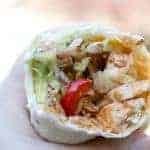 Wrap dough in plastic wrap and chill for at least 30 minutes. 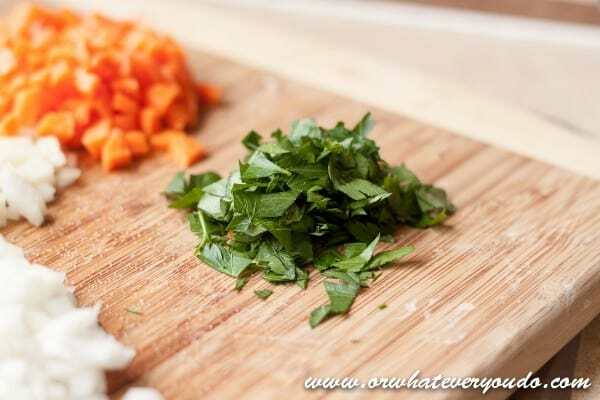 While the dough is chilling dice up your vegetables into 1/4 inch dice, and chop up the parsley. Remove the chilled dough from the fridge and cut into 6 equal chunks. Roll out individual chunk into a circle slightly larger than your hand on a well-floured surface. 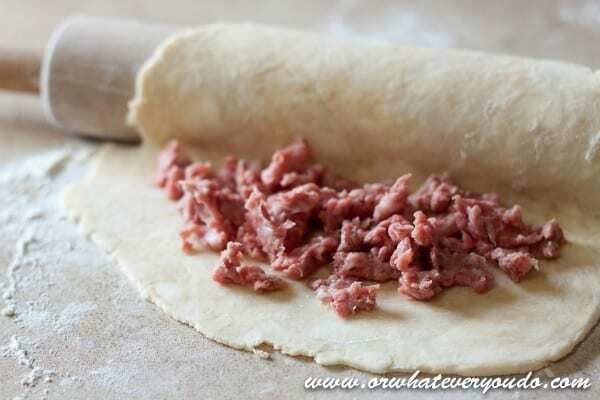 Place approximately 1/8 cup each of chunked up ground pork and beef on half of the dough circle. Salt and pepper well. 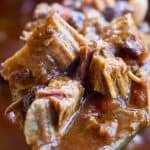 Add small portions of vegetables on top of meat. Add salt and pepper. Sprinkle parsley on top. Fold over the other half of the dough, lightly wet the edge with moistened fingertips, and press to seal. Crimp edges by folding up and over and pressing down. Repeat with the remaining dough portions and place all onto your prepared pan. Brush the tops with your egg wash, and cut three small steam vents into the dough. 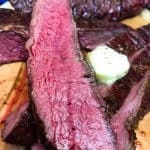 Serve with brown gravy or ketchup. Would you par-bake the or fully cook before freezing? I would par-bake it first before freezing, and wrap in non-stick tin foil. Then you can just pop it right in the oven when you are ready to make it.